The Mansion is treasured by the West End community. The Gabriola Mansion has been empty for a number of years and the community is concerned about vandalism and further deterioration. More importantly the community sees a significant opportunity to create a special place for the Mansion in the community. During the West End Planning process, the community suggested many potential uses for the building including, a library, an art centre, a community centre and a museum. The Mansion is one of the most historically significant buildings in the West End. In the early 1900s, the West End with its grand Victorian mansions was known as “Blue Blood Alley”. Designed by the famed architect Samuel Maclure, The Gabriola Mansion was known as the most lavish and opulent home ever constructed in British Columbia. 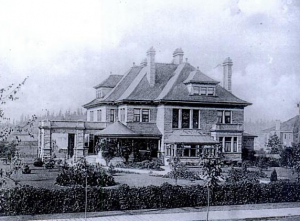 Today Gabriola is one of two remaining West End mansions from that period. It is listed as an “A” heritage building on the City of Vancouver’s Heritage Register and is a designated building. A designated building cannot be demolished, but It does not stop it from deteriorating. The Mansion is in a very prominent West End location. The grounds, gardens and Mansion cover the entire block between Cardero and Nicola streets on Davie Street. 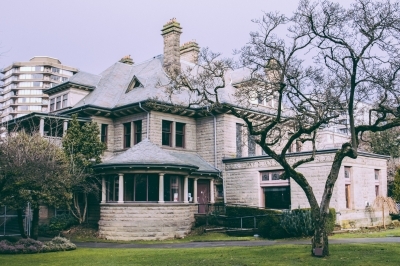 The Gabriola Mansion is the focal point of Davie Street providing a sharp contrast to the businesses and apartment buildings. The prominent location highlights the Mansion as a valuable community resource.